Thomas Fremantle was born in Hampstead, London, the third son of John Fremantle. He went to sea at the age of 11, becoming a Commander in 1790, when he was serving in the Mediterranean. 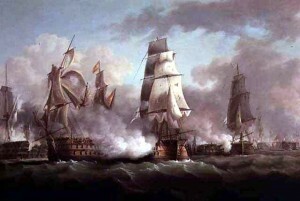 In 1795, whilst commanding the Inconstant, a look-out frigate for the British fleet, he engaged a much larger 80-gun French ship by the name of Ca Ira, which had lost its topmast and foremast. Although beaten off, it was Nelson, on the Agamemnon who came to his aid, capturing the Ca Ira and another ship, the Centaur which had her in tow. This action was the first of many in which Fremantle joined Nelson over the next ten years. In 1796, Fremantle was given the task of rescuing some British families from the Italian port of Leghorn – as they sought to escape Napoleon Bonaparte’s invading army. Amongst these refugees was Fremantle’s future wife, Betsey Wynne. They were married in the home of Lord and Lady Hamilton in Naples in January 1797. In July 1797, whilst engaged in a disastrous attack on Santa Cruz in Tenerife, Nelson and Fremantle were both injured in their right arms. Nelson had his arm amputated, whilst Fremantle’s was saved. But both needed to return to Britain for a period of recuperation. Nelson is said to have written his very first note with his left arm to Betsey, now pregnant with her first child, with the words, ‘God Bless You and Fremantle’. Whilst Nelson quickly returned to naval service, destroying the French fleet at the Battle of the Nile in 1798, Thomas Fremantle needed to find a home for his new family, which he did in the village of Swanbourne, paying 900 guineas for ‘The Old House’. It was not until May 1800 that Fremantle felt sufficiently recovered to offer his services again and was given command of the 74-gun Ganges. Here he was engaged in activity in the Baltic, and in April 1801, joined in the attack on Copenhagen, the occasion when Nelson is said to have put his telescope to his blind eye, claiming he could see no signals. After a respite from war, following the short-lived peace of Amiens, Fremantle returned to the command of the Ganges as part of the blockade on the French fleet. 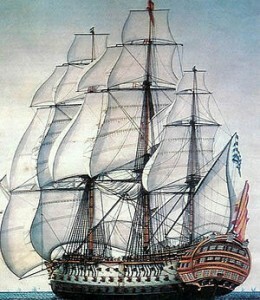 Then in May 1805, he was moved to the 90-gun Neptune on which he eventually joined the British fleet off Cadiz. When in October 1805, the French and Spanish fleets eventually left port, Fremantle was one of Nelson’s ‘band of brothers’ ready to take on the combined continental fleets. The Neptune took its place 3rd in line behind Nelson’s Victory and the Temeraire as they sailed into action at Trafalgar. 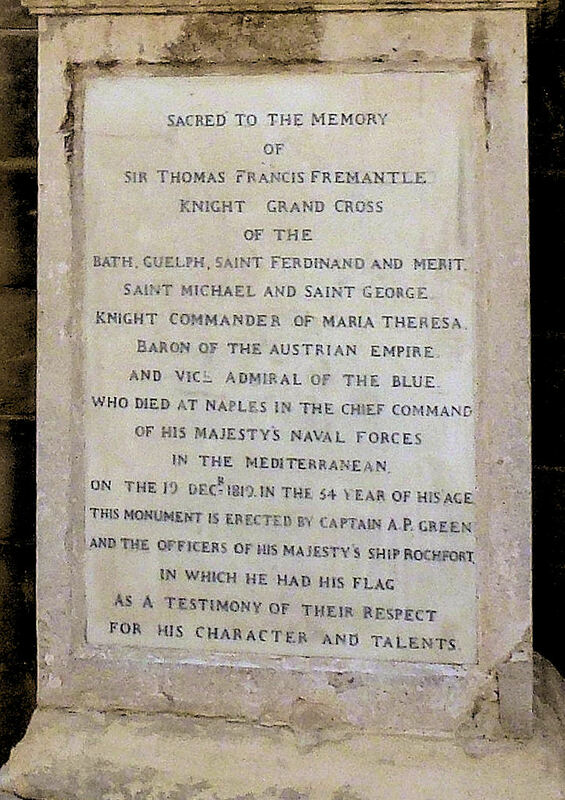 Fremantle was in the heart of the battle, and succeeded in disabling, boarding and capturing the huge Spanish vessel the four-decked Santissima Trinidad, which provided Captain Fremantle with trophy silver which was taken from the Chapel on the ship. The Spanish Naval flagship Santissima Trinidad, one of the most powerful warships in the world, easily outgunned the Neptune, but – against the odds – was boarded, captured and plundered by Captain Fremantle and his men. After the Battle, he briefly took care of the captured French Admiral Villeneuve, before taking on the task of towing the crippled Victory to Gibraltar. To his dismay, he was then kept at sea for another year, before eventually returning to Britain in October 1801. By this time, there had been a change in the Government, and the new Prime Minister was Lord Grenville, a personal friend, and Fremantle eventually was appointed as a Lord of the Admiralty. He was then found a place in Parliament, representing the Admiralty borough of Sandwich. However, his parliamentary career was very short-lived as Grenville soon fell because of its support for Catholic emancipation. Fremantle was then given charge of the royal yacht, William and Mary, before being promoted to Rear Admiral in 1810 and appointed to a command in the Mediterranean, where he continued to serve until 1814. In January 1819, he became Commander-in-Chief of the Mediterranean, but he was only in this role for a short while, as he died, unexpectedly in Naples in December of that year. 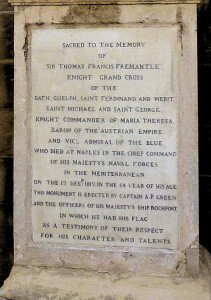 He was buried in Naples, but a memorial was erected to him by his crew on the island of Malta.